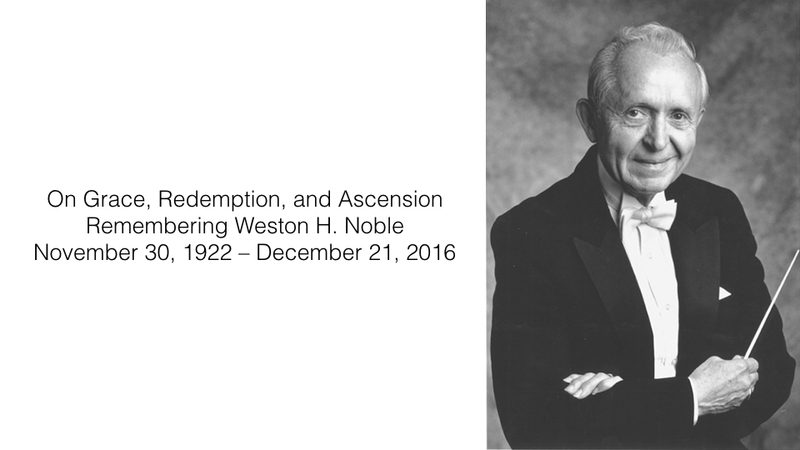 Weston Noble recently passed away on December 21, 2016. For those of you who didn’t know him, he was a remarkable man. He was best known as the conductor of the Luther College Nordic Choir for more than 50 years, but that was only one part of his life. He was a band director, college recruiter, choral clinician, farmer, humanitarian, piano teacher, mentor, volunteer, trash collector, and tank driver. Yes, tank driver. He served as a tank driver on the Western Front in WWII. The Army felt that his tractor driving skills, coupled with his small stature, made him a perfect tank driver. That is actually how I first met him, not, of course, while driving his tank during WWII, but during a jr high oral history project called, Foxfire, which connected students with older local residents with interesting oral histories to share. My dad, who was a history professor at Luther, knew about Weston’s WWII experiences in Western Europe, and so he set up an interview for me. Weston had a lot of demands on his time, but he still made time for me, a skinny (yes I once was), dorky (but still am)14 year old kid asking about one of the most trying and painful experiences of his life. I remember asking him whether he was scared to die in battle. He replied yes that sure he was lots of times, but he kept on thinking about the mission, his fellow drivers, and the next valley, the next town, and the next bridge to cross. And before he knew it, he was in Hitler’s office taking a sledge hammer to his desk. Oh what I wouldn’t give for a picture of that moment! He sent that piece home, but it was lost on the transatlantic ship home. Lots of time veterans who have experienced battle say that anyone who says they are not scared of death is not telling the truth. Weston in passing said that he was, and that he experienced moments of fear, but somehow, I got the sense that he was not afraid. He had an abiding power and faith that he demonstrated in everything that he did. Perhaps it was because he already from a young age seemed like kind of living saint, seamlessly weaving this spiritual realm with the mundane matters of everyday life. He shared many moments of light amidst the darkness, like when, after a battle, he stopped by a local church to see if he could play the organ. The rector granted permission and there was Weston, sitting there with grease on his face, in a mud stained uniform, playing the organ. That story always makes me laugh. I can just see him there delightfully perched on the organ bench, helmet askew, while happily playing his favorite Bach, or Mozart tune. He was one of the rare persons whose humility exceeded his greatness. And not in a kind of “awe shucks, look at how humble” I am kind of way. He lived it. Some Luther students first introduction to Weston was through choir, or Messiah rehearsals. For others, after a long night out, they were likely to see Weston, legendary giant and world renowned choral director, picking up trash on campus. Little did they know that that trash collector was a living legend, who probably single handedly saved Luther College, transforming it from a struggling liberal arts school to a well respected Lutheran liberal arts college of almost 2500 (1500 of whom were probably directly recruited by Weston). He often scaled up steep valleys sides, picking up any piece of trash that he could find. People often worried about him falling down, but he ever did! I can still see him crawling up the hill side wearing white tennis shoes, polyester pants, and those vests. He also showed remarkable moments of grace. And this is where I want to share where he truly touched my life. In a moment of shame, humiliation, and disgrace, he forgave me, and showed me remarkable compassion. Choir tours are a mixed bag. On the one hand, they are a wonderful opportunity to bond with fellow students. You do probably 14 concerts in 16 days. They are exhilarating, but exhausting too, one city after another, one home stay with a new family, set up risers, take them down, getting on bus for another 8 hour trip. And each day there was the indefatigable Weston, marching along day after day with his bright cheerful smile leading the way. On one of the final nights, we concluded with a hotel stay Green Bay. The hotel there had a free happy hour! I couldn’t believe my good fortune. After being couped up on a bus for three weeks, we had alcohol, and it was free!!!! Woo-hoo!!!! The next thing I knew, I was being kicked of the hotel for a variety of reasons (those of you were there know why ;)), but most prominently, I was blitzed out of mind. I had never drunk so much so fast as stupid 22 years old sometimes do. The next day, after I woke up with a splitting headache, and mild nausea, our tour manager convened the choir together, and admonished us for embarrassing ourselves, and the reputation of the choir. I sat there quietly, silently coming to grips with how stupid I was, but worse, I felt so ashamed for acting that way in as a representative of such a holy and saintly man such as Weston Noble. There is absolutely nothing worse than feeling alone, and isolated from the group. I thought Weston was going to be furious with me, who knows,maybe even kick me out. After the other choir members had left the room, Weston, rather than being mad at me, approached me, and said, “Cole (he always called me by my last name), I know you didn’t mean to. It is ok. I still love you.” I couldn’t believe it. Rather than kick me out, he reached out gave me a hug, forgiving me in a moment of undeserved mercy. I broke out in tears, and wept in his arms for probably about 10 minutes. I then finally settled down, feeling a little awkward after having tear stained the shoulders of one the greatest living choir directors. I got myself together, and we performed later that night. We continued and finished the tour with no more near arrests. He had every reason to be angry at me, and to punish me, but he didn’t. He showed me grace, and forgiveness. And only, Weston, could transform possibly one of the worst moments in my life, to a moment of pure redemption, which I will carry with me always, that moment of undeserved grace. I never talked with him about that event ever again, but he often referred obliquely to the wonderful benediction that I gave, and how much he appreciated it. I wasn’t sure whether he was referring to that moment in Green Bay, or my senior reflection a short time later. It could have been one, either, or both, but he never brought it up directly to me again, and I have never really talked, or written about since (aside from a few uncomfortable joking about among friends later on). Weston Noble was a living saint. He didn’t as much direct a choir as intermediate between the humans producing the sound and the spiritual realm that we accessed in unison through him. Weston helped us connect to a hauntingly beautiful other wordly dimension. In my mind’s eye, I can see him there in front of us on the risers, gently leading us. Aspiring choir directors would observe his technique during concerts. And I would tell them, learn from our choir rehearsals. That’s where we do the technical stuff. His choral conducting was unique to him, more of a prayerful meditation in communion with the students he was directing. It was pure emotion and connection. And I have so much gratitude that I was able to be a part of that. I used to joke that Weston Noble would never die. He would merely ascend during one of this concerts on the wings of angels, and leave us there in silent awe at what we had observed, and experienced. And that is most remarkably what happened. He died on the Winter Solstice, between the Luther’s most famous choral event, the Juletide Festival, and three days before Christmas. He did ascend on the wings of angels, just as I had always imagined. I will carry his undeserved grace with me always. and for every life that you touched on this earth in the past, present and your future. Your spirit will live on within us forever as you ascend into the Magnum Mysterium of Creation. We will carry your message of peace, grace, and light with us as long as we live. May you rest eternally in peace. Source: The above was posted to Facebook on 23 December 2016 at 11:21 AM CT.